its mall location. I was curious when I had first heard the announcement as to whether you would be able to access the store from the mall. Unfortunately, the answer appears to be, "no". I found this very disappointing as I could envision mall shoppers taking advantage of picking up a few grocery items while at the mall. I realize some may say that shoppers can still do this; however, it certainly is much less convenient. 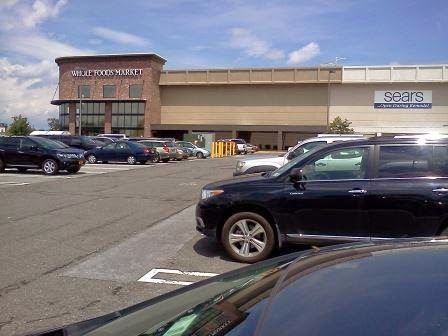 Moreover, the nearest mall exit point to Whole Foods entrance is through Sears and I suspect for many, Sears may have not been a mall destination and these shoppers may not want to trek through Sears to get near to the Whole Foods entrance. On the particular day that I visited temperatures were approaching 90° with high humidity. Upstate New York also gets significant rain and also has extremely cold temperatures in the winter. I think many shoppers would have preferred the ability to both mall shop and grocery shop in an uninterrupted climate controlled setting. Thus, I'm not understanding why the choice of a mall location if you're not going to take advantage of a huge mall convenience. Aside from the challenge of parking in a mall environment, entry and exiting Whole Foods can also be a challenge. I had taken a sneak preview of Whole Foods over a weekend - it was extremely busy. I returned on a Monday and it was less busy, but still brisk. Shoppers enter and exit the same automatic door so on both occasions, the entryway can become a choke point for shoppers. There is a large eating area within Whole Foods. The concept of lunch at the "grocery" store is growing quickly in the Capital district and Whole Foods certainly appears to target a lunch crowd in addition to take home grocery shopping. The eating area was large and inviting excepting for the surrounding noise and foot traffic. As most probably expect, the emphasis of Whole Foods is on freshness; local and organic are both plentiful throughout the store. Overall, my impression is that although there were some "specials" that offered good value, Whole Foods is not the local place to go for the price sensitive grocery shopper. 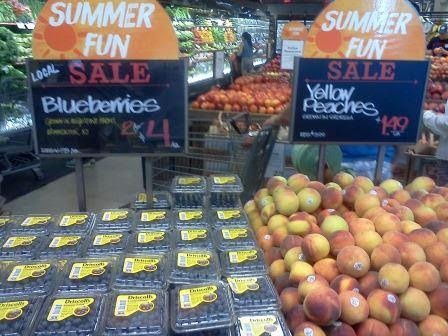 Blueberries and Yellow Peaches were attractively displayed and on sale on this visit. In addition to the fresh produce, I thought the fish offerings were superb and displayed extremely well. Among the "misses" was the freezer section. On the occasion that I visited, the glass was almost completely fogged so that shoppers had to open the door to see the offerings and shoppers such as myself tend to give up and not look. Neither is this satisfactory for energy conservation or temperature control of the food. Whole Foods also boosted an extensive salad bar, soups and hot foods area although some choices would be a bit pricey at the advertised $8.49 per pound. Check out is one of my most important considerations for selecting shopping destinations. On my weekend visit, I saw the shopper density and did not find a bargain worth the torture of check out. On my Monday visit, the shopper density was not as severe so in the spirit of exposing myself to the true full experience, I purchased a few sale items. Despite the lower density, check out at Whole Foods is a choke point. I was very relieved when a friendly shopper saw that I only had a few items and offered to allow me to check out ahead of them. As a final note, Whole Foods was very generous with a 10 cents "Go Green Bag" refund for bringing in my own reusable bag. This is the largest amount that I know of in the Albany area (Price Chopper 3 cents, Target 5 cents, Shop Rite up to 5 cents, Hannaford and Walmart zero)... so if you are going to Whole Foods, bring your reusable bags!